The High Commissioner H. E. Professor Joyce Kakuramatsi Kikafunda Presents Her Letter of Credence to The Governor General of Australia, H. E. General The Honorable Sir Peter Groscove AK MC (Retd). 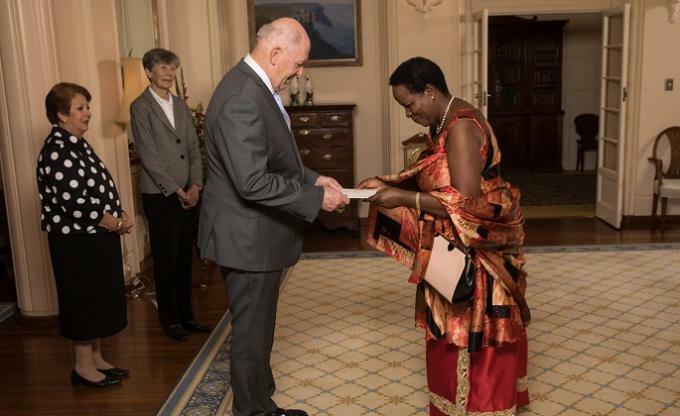 On 23rd November 2017 Her Excellency Professor Joyce Kakuramatsi Kikafunda presented her Letters of Credence to the Governor General of the Commonwealth of Australia His Excellency General Honourable Sir Peter Cosgrove AK MC (Rtd). She was accompanied by High Commission Officials Ms. Carol Lwabi (First Secretary) and Ms. Juliet Okunia (Third Secretary). During the ceremony at Government House, Her Excellency Professor Joyce Kikafunda had a brief discussion on bilateral issues with His Excellency the Governor General. The Governor General thanked Uganda for the great role in hosting refugees from the region especially from South Sudan. His Excellency the Governor General also praised Uganda's role in keeping peace and security in the region especially Somalia. His Excellency the Governor General informed H. E the High Commissioner that he is keen for Australia investors to invest in Uganda, mostly in the Service Sector of Oil and Gas. On Education, he was happy with the collaboration of some Australian Universities with Uganda Universities and agreed that more could be done.